It occurs just about every year when the weather gets hotter. You start to invest much more time outside on the grill, hiking and running, or throwing around the baseball with your children in the yard. You look forward to the beginning of summer. How Can You Have Safe Stormwater Management? Stormwater management is the process or the act of dealing with the quantity and condition of storm water. This includes structural and manufactured control devices and systems (e.g. retention ponds) for treating dirty water, as well as functional or procedural routines. Management of storm water is really important, particularly in cities where storm water runoff is an issue. If you’ve thought about putting in your own exterior yard lights but thought it was too complicated, this is to tell you that it is not. Outside yard lights can be easy to install if you have a design in mind. A first rate design is a necessary component of any exterior yard lights installation. Outside yard lighting comes in a few different variations and before you start planning, you should decide the one you prefer to implement. Also, you are going to want to remain open to new landscape designs that may just allow you to come up with a landscape that simply astounds you. The first type of exterior yard lights is cabled, electrical exterior yard lights. If you are going to install this, you are going to need to have an existing electrical outlet on the exterior of your house. Every one of the lights is connected along a sequence of protected electrical wiring. Planning for this setup you need to consider both the light fixtures and the cord that they are connected to. Prior to setting up the first lights, it is recommended that you start by outlining your front or back yard, depending on where the lights are being positioned. Draw out and measure the same distance between each of the lights then plot them out inside your yard. You should be sure that you have enough wiring and space for the wiring behind the lights. The advantages of choosing the electrical exterior yard lighting scheme are that you can switch it off and on whenever you want, it constantly has power, and you can purchase more powerful lights for the set-up. The cable systems are usually less expensive also. The other kind of exterior yard lighting set-up makes us of solar lights. A solar garden lighting set-up takes the sun rays and charges up in daylight then turns on after it gets dark. These systems are very easy to set up and do not need as much designing that the cabled set-up does. Besides that, it is relatively easy to rearrage the lights if you do not care for where they are. There is no upkeep needed for this style of system and it is very easy to maintain. If any component breaks it can easily be replaced. The advantages of installing the solar lighting system are how uncomplicated it is to setup and how uncomplicated it is to make adjustments to. This kind of installation can also be fixed very fast if there are any problems with the components within the system. The primary disadvantage is that they generally are more expensive and are not nearly as bright as the electrical system. Also, this kind of exterior yard lights needs close to 8 hours per day of sunshine to be completely charged up, so if you live in a region with little sunlight it can be difficult to keep the system up and the lights shining vividly. As you can see there are pros and cons to each system, so make sure you consider your location before you come up with your final decision. Where is Your Lawn Company? Many people who finally launch their own lawn services company do so after operating for some time as an independent contractor. This is a good way to go because you can build your customer base but keep your costs minimal. Often times you may operate like this doing most of the work yourself and so avoid having to keep "employees" or deal with partners. The thing that may be pushing you to start your own lawn care business may be that you are just too good at your job. Your business is growing to the point that you may not be able to service all the customers without changing your profile from an individual contractor to a small business owned and operated by you. This is a natural growth and businesses that start because of this kind of growth curve often succeed because you know the business and you know how to control costs and take good care of your customers. The problem comes when the needs of the business outgrow your physical space that you consider to be "home base" of the business. In most cases when you start doing lawn care as an independent contractor, you may use the same lawn care equipment that you use for your home. Your garage is your "home base" and you keep track of the business details on your home computer. When you take that big step of actually starting your own lawn care business, you have a decision to make. Do you continue to use your home as the base of operations for your business or do you invest in a business location to give you offices, a larger garage and storage facilities for the wide diversity of tools and equipment you and your employees will need to take care of the business you support? The argument in favor of operating your small business from your home is economic. If you can launch your lawn care business with little or more additional expense and avoid taking out loans, you can use the profits to buy more equipment, pay for additional workers and eventually afford a larger space. This is outstanding business management if you can pull it off. The problem is that you often have to invest in growth before the growth is a reality. To try to grow a business out of your home and garage means there will come a time right before you finally lease space for your business that it will be overwhelming your home. That can become a big problem for your family and for keeping the equipment of your business safe and separate from your private property. It is smart to start out keeping costs low. But when the time comes to formally launch your lawn care business, that may be the time to secure a small business loan and get a separate operating location for your new business. Building and maintaining a separate location that is the physical location of your business has some real advantages. For one thing, the people who work for you and do business with you have a place to work and interact with you that is only about the goals of your lawn care business. Your family does not have to interact with your employees or clients and you can keep your equipment and paperwork of the business in one location secure and separate. For you, it is a place to "go to work" and it gives your business a real legitimacy that is important when you are seeking to be seen a real business operating in the lawn care markets in your community. A separate facility gives you plenty of room to store your equipment including trucks and trailers you may need to transport your equipment to each job site. It gives you room to work on that equipment, clean it and effect repairs. And if you select the right location, you have room to grow when you buy more equipment to support your rapidly expanding business. Just as you dress for success, equip your business with a "home base" that is ready for growth because you know growth will be coming. Then the physical location of your business can grow with you step by step to greater levels of success each year. Making all areas of one’s home functional involves equal distribution of arrangements. As some parts of the home need less attention for design or landscaping, it does not sum up to leaving other areas to be not presentable making it off limits. Since balance is one of the key elements in landscaping this wouldn’t apply much on working on a frontyard landscaping, balancing what’s in it for backyard landscaping.On deciding how backyard landscaping should go, one must determine the difference between a front and backyard. Obviously, the one in front is seen by most people so it is given that details are of the essence. However at the backyard, it is more of a private place for the residents. The designs and materials that are to be placed in a backyard landscaping project mostly depends on the person himself. He can either go for an ambience for relaxation by adding a swimming pool which actually can serve also as an entertainment centerpiece. Adding a pool in the backyard is one of the best ways to accentuate a backyard. If this is a bit off the budget, creating a pond can also be an option. This is very advisable as the use of water and greens from plants provide a good ambience that is beneficial. Also keep in mind that at one point, guests will come in and this perhaps can be the best area to have them entertained. Pieces to be added up on a backyard can also be chosen. It can either be expensive or affordable depending on the person’s preference and working budget. What’s up front can make what’s inside something to look forward to. This is the main reason why frontyard landscaping is also a crucial thing to give attention to. Since neighbors who get to pass by your home will first pass through the front yard, it leaves a certain impression either the people living inside are welcoming or unpleasant. Since frontyard landscaping designs challenges one’s creativity, going for simple accents will make a good front yard too.In order to have a good frontyard landscaping design make sure you have fun doing it. Otherwise, welcoming creative ideas will be a bit hard. For beginners in frontyard landscaping, there are some points to be considered. Since designing is one basic part of landscaping, some rules still apply. Since growing of plants will be part of the landscaping work, consider the ones that suit the climate that you live in. Otherwise, it will not live long enough. Choose plant colors that compliment an area of highlight on your home. Go for neutral tones if you want to emphasize the wholeness of the home’s front and work with certain colors if you want to emphasize your home’s walk way or front door. Instead of using fences, you can also go for planting shrubs. However, make sure to maintain a certain shape of growth for the shrubs as you don’t want it to grow as a wild mess. If you still want to go for fences, these can be accented by plants that can cling around it, providing a demarcation for crossovers. Trees are the integral part of our environment and also the main contributor to the natural aesthetic beauty and serenity. They must be planted in a large numbers to maintain the balance of nature and proper planting of trees involve a lot more than just digging some mud and placing the plant. Certain key points must be taken care of during planting trees to provide a better and healthy life to the tree. Remodelling an outdoor space as an entertainment area is not something that most people do just by thinking about it. So, getting round to planning outdoor patio lighting often becomes the last thing to do to a house. In the real sense of the word, this place should be able to accommodate fun activities for everyone even if it is just to add the ideal light. Nobody likes for a tree to be cut down needlessly, but occasionally tree removal is necessary. Any scenario where a tree has a safety hazard is grounds for removal. A tree may also have to be removed for practical or aesthetic reasons. As the days grow colder and your house gets warmer than the outdoors, pests are trying to become your new roommates without paying their part of the bills. It's not right, but there's nothing that can be done about it except launch a war to kick them to the curb where they belong. You can take preventative measures so that these nasty squatters don't have an easy way to invade your home. Windows are a favorite among pests looking for a cozy place to stay. If you want to avoid unwanted pests, then it's essential that you inspect your screens regularly for any holes or tears. These openings will make it easy for pests to enter your home. If you don't have screens on your windows, then you may want to get them installed. Make sure that there aren't any holes or gaps around the window casing itself. If your windows do not shut properly or are difficult to open, then this may be a sign that it’s time to replace your windows. Ultimately, the tighter you have them sealed, the fewer pests you will have to deal with in the long run. Sheds are where you'll find spiders and other types of bigger critters. It's a warm place where the walls block the cold winds. Pest-proofing a shed requires a little bit of a different approach than pest-proofing a home, but it serves the same purpose as other methods used in home pest prevention. All Storage Online explains, “cleanliness is an important factor for limiting the reproduction of spiders. It is also important to seal all cracks and crevices leading into sheds to deny pests access to their desired living conditions. Check sheds and outside storage areas for spaces under the doors or cracks in walls where pests could enter. Try to keep the inside and the exterior of the shed dry since spiders like humid conditions.” Always be cautious if you think an area may have spiders or other potentially dangerous pests. Dryer vents are easy for pests to get into, and pests can be drawn to the heat that's emitted when your dryer is in use. If a rodent or pest gets into your dryer vent, then you will be left to deal will a variety of problems. Unwanted invaders can damage your dryer, cause a bad odor, result in illness, and start a fire. An easy fix is to take a piece of screen and secure it so that it covers the opening on the exterior of the house. This will make it difficult for pests to get in there and cause you headaches. Keep an eye on these places to prevent pests from entering your domicile or surrounding structures. It's important to call in professional pest control services when in doubt. Your safety is always the utmost priority. If you’re looking for more ways to make it easier to maintain your home’s exterior, then keep Crider’s Landscaping in mind! After many years, even homes with beautiful exteriors can become outdated. Siding begins to fade, landscaping becomes overrun and driveways can become cracked and ugly. When your house's exterior begins to look outdated, it's time for a little tender loving care. If you're thinking about updating the exterior of your house, there are a few places that you can start. Here are three of them. Overgrown landscaping can really put a damper on the appearance of your entire yard. One of the first steps you should take is to remove any weeds or landscaping that has grown too large for the space that it's in. Many bushes and trees start out tiny, but after many years, they begin to grow beyond their spaces. After you remove everything that is either too big or dead, you can then add in newer, more attractive landscaping. The driveway is one of the first impressions of your house that people have. Driveways are more than just functional. If yours is starting to crack or has chunks missing, understand that repaving or upgrading your driveway doesn't have to be a complicated or expensive process. If you have a blacktop driveway, even a simple coat of tar can greatly improve the aesthetic appearance. If your driveway is concrete, you can shop around for the best deals or wait for the off-season. If you're interested in getting a completely new driveway and want some upgraded features, you can install heated driveways so that removing ice and snow is easier in the winter time. Some siding should be painted, and if the paint is beginning to fade or chip, it's time to give your house a makeover. The siding might need to be done, or you can even paint your front door or garage door an accent color. However, as a word of caution, be careful if your house is currently a darker color. If you choose to go with a lighter color, remember that it will take several more coats to go over your current color, and it will likely need a good primer paint. The exterior is people’s first impression of your house, and if you want to give off a good impression, you'll need to do some maintenance from time to time. There are many projects that you can start with, but take some time to plan and budget so that you have a house that you can be proud of when you're done. Do You Know How to Care for Your Trees? The value of trees to a property is incalculable whether they are small trees that erupt into blossoms in the spring or ancient and majestic oaks that provide shade and beauty. Here are some ways to take care of your trees. Spreading mulch around trees keeps the soil moist, discourages weeds and keeps the roots cool in the summer. Organic mulch eventually breaks down and puts much-needed nutrients into the soil. Spread mulch to the drip line of the tree but don't let it touch the crown where the root meets the trunk because the tree uses this area to breathe. The layer of mulch should not be more than 4-inches thick. A sapling needs plenty of water when it is first planted, and then, it should be watered deeply and regularly for the first two years or so. The rule of thumb is to water the tree down to the end of its roots. If the owner is worried that the soil is too dry, they should dig a hole about 2-inches deep next to the tree and feel the soil in the dug-out area. If it’s dry and crumbly, it needs water. Some of your trees may need a little support to remain growing straight instead of leaning. If this is the case then you will need to use stakes and baling wire in order to create an effective support for your young tree. Generally, it is recommended that 14- or 12-gauge wire is used for bracing the tree and the wire by itself may cause harm to the tree so it needs to be threaded through a length of rubber or hosing. Ideally, two stakes are placed just outside of the tree's root ball and the wire is looped around the trunk and secured to the stakes. Be careful to no secure the wire too tightly. Make sure that it is firm but loose enough to allow for some slight movement from the tree. Unwanted pests can cause damage to your tender trees as they try to survive during all seasons and weather. Part of caring for your trees is finding ways to remove the pests in the most natural and cost-effective way that will not damage the trees or the surrounding vegetation. Clean up all debris from around the tree. That includes dead leaves, seeds, flowers, twigs, nuts, and trash. Leaving them encourages pests and diseases. If debris falls on the mulch, it should be removed. The mulch should only be tidied if it looks disordered. Diseases of trees often show up in the leaves. One of them is rust. Rust creates mottled brown or orange spots on the leaves. Rust is more unsightly than dangerous. When the leaves finally fall in autumn, don’t add them to the compost pile but destroy them. Another disease that shows up on the leaves is powdery mildew, which is encouraged by cloudy, humid weather. Fungicides can take care of powdery mildew. If you suspect your tree has a disease, bring a leaf or two to your local nursery. There is often someone there who can help to diagnose the problem. Diseases on trees often “over-winter,” meaning they hang around and repopulate during the spring, so it’s critical to get it treated by a professional. Fall is the time to remove dead leaves from beneath deciduous trees. They should be raked away gently with a bamboo rake that won’t damage the roots. Fall is also a good time to give a young tree a good soaking and refresh the mulch. Mulch keeps roots cool in the summer and can also protect them from cold in the winter. When all the leaves have fallen, give the tree a mild pruning. Trees that are well-established don’t need pampering. Still, there are things that owners can do to encourage their trees to thrive. As the fall season ends, and the winter season begins, you’re going to need some landscape maintenance. As you do, keep Crider Landscaping. Keeping pests out of your garden can be a real challenge for any gardener. But for those committed to natural methods and organic gardening, it can seem even more difficult. But don’t worry, as there are actually a lot of things you can do to keep bad bugs away without polluting your garden. Here are five of them. Frequent HGTV contributor Meagan Francis offers this tip. “Many aromatic herbs, like yarrow, citronella, mint, fennel, catnip, basil, and lemongrass are natural deterrents for garden pests from aphids to potato beetles.” Scattering these and other plants strategically throughout your garden can greatly improve the chances of pests leaving your garden alone. Not only that, but who doesn’t love having fresh herbs from the garden to add to their favorite recipes? As discussed already, Planting aromatic herbs in your garden can repel some kinds of pests. Thankfully, you can still benefit from these plants without actually growing them in your garden. You can do this by using essential oils such as lemongrass, peppermint, cedarwood, rosemary, and spearmint oil. A few drops of these lovely extracts strategically placed around your garden plants can keep some types of pests away for days or even weeks. The length of how effect it is depends on how often you need to water your garden and on where you place those drops. Placing them in dry spots around your plants might help them last a bit longer. Frogs, toads, lizards, birds and even cats are known to munch on many of the pests that threaten your garden. The trick is to only attract the predators you want, such as toads and lizards, without attracting the predators that you don’t want, which would include the birds and cats. While birds and cats might be a lot more fun to look at - and cuddle - they might end up causing just as much damage to your garden as the bugs! Make sure to keep lots of loose, moist soil around for toads to settle into. Lizards will enjoy some rock walls and large rocks in sunny areas of the garden upon which to warm themselves. There are also several varieties of insects that prey on other insects. These could also do an excellent job of guarding your flowers and veggies against pests. Spiders, ladybugs, and wasps are known to eat other bugs like aphids and caterpillars, so be sure to leave those spider webs intact whenever you come across them in the garden. You can make sure to keep lots of pollen and nectar generators in your garden as this will attract many insects that eat common garden pests. You could also make sure there is enough water that it can form small pools, which will keep the predatory pests well hydrated and ready to remove any harmful pests. One more tip is to sprinkle crushed egg shells along the surface of your garden soil. Slugs and snails will avoid their sharp, jagged edges as they slither along the ground, so including these around your perimeter could convince those slimy pests to look for more friendly terrain. Protecting your garden from pests without resorting to harsh chemicals and pollutants is possible even if it doesn't feel like it. Just follow these five organic gardening tips to keep your flowers, veggies, herbs, and fruits safe from pests. If you’re prepping for a garden or are just in need of a yard facelift, keep us in mind. We have worked in all sorts of landscaping and yard beautification situations and have great results. See how we can help you today! The latest trend in backyard design is the outdoor living space. Families everywhere are recognizing the value of installing an outdoor kitchen or living area in their backyard. Not only does this area provide an ideal place to entertain guests, but it also serves as a natural extension of your indoor living space. A porch is a great way to increase the outdoor living space for any home. A well-designed porch can support a hot tub, play area, seating area, and a grill. You'll have to consider your needs and budgeting into account. There are financing options for hot tubs and more to help you achieve your dream backyard. Window well covers boast a myriad of practical uses in any yard. These covers serve as a protective measure because you do not have to worry about anybody falling into your window well. Window well covers are also good for home security — intruders often enter homes through low-lying windows, window well covers work to keep people from getting into your home through the lower windows. The covers also keep debris, leaves, and more from piling up in the well and hindering the exit of anyone in the event of an emergency. Outdoor lighting is an easy and practical way to add value to your home. With an abundance of options including tiki torches, solar lighting walkways, and ornamental bulbs, there is an outdoor lighting option for every personal taste and budget. Lighting provides a unique ambiance to any outdoor area while also adding security to the yard. Add a touch of color to your house with the addition of raised flower beds. Although it is a cliche, it is true that you never get a second chance to make a first impression. A well-maintained flower garden in the front of your house will greet visitors and set the tone for a cozy and beautiful interior of the home. Do not miss this opportunity to impress potential home buyers before they even step foot in your house. With a little work and creativity, you can raise the value of your home with these four practical outdoor elements. By carefully researching and choosing what features to invest in, you can ensure that you will get the most out of your house when it is time to put it on the market. A sinkhole can occur whenever a hole inside the ground causes the surface layer to collapse. There are often a few telltale symptoms of a sinkhole that appear before the top layer of the earth actually falls in. Be sure to keep an eye out for these sign of a sinkhole on your land. The most obvious sign of a sinkhole is a large hole that rapidly appears in the ground, but this does not always happen. In some cases, the earth might only form cracks or tiny little gaps. The lawn might not even display any noticeable cracks or gaps, but it might still begin to warp and look dipped. If the sinkhole appears underneath your house, the uneven shifting of the ground can cause issues. You might find that the grout between your tiles cracks, or the sheetrock near the windows and doors may develop cracks. You can also look at your interior walls and door frames to check for cracks. 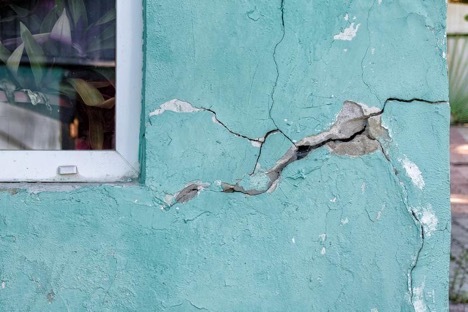 If you begin to notice these signs within your home, these environmental safety experts counsel, “If the hole is directly impacting a house, and sinking, sagging, or cracking walls are apparent, stay out of the dwelling. Call the property insurance adjuster and report it immediately.” Any amount of damage could cause structural damage, which can cause the house to collapse partially or entirely, risking the lives of anyone inside. A sinkhole can also affect your landscaping. You might have a sinkhole if you notice that one of your trees is beginning to slant or tip over. In some cases, the grass or other plants situated on top of a sinkhole might start to die because their roots are being disturbed. If you notice any of these signs appearing on your property, it might be a good idea to get your land checked out by a professional. Catching a sinkhole early can keep it from causing excessive damage. If you find the sinkhole before it collapses completely, fixing it can be as easy as getting help from an engineering expert to fill in the sinkhole before repairing your landscaping. If you’ve had some issues with sinkholes in your lawn, and are in dire need of some landscaping or restoring care, keep us in mind! We don’t think of your lawn as just a piece of earth, plants, and rocks. We consider landscaping to be an art form all on its own. We guarantee you’ll be happy with the results. Check out how we can help you today! While you're working outside in your yard or trying to clean your home, going through boxes in a dark closet, you might come across a spider. If you live in the southeastern area of the country, then there are a few spiders that you might see more than others. It's important to pay attention to the details of some of these spiders as there are some that are poisonous and can severely impact your health if you're bitten. This is a small brown spider that sometimes has yellow specks on its back. The front legs are a bit longer than the back legs. You'll usually see this spider inside your home more than outside. They like dark areas and often build nests where they feel that they won't be disturbed. If you shine a light on the spider, you can sometimes see the shine on its back. This spider grows to less than an inch in size. It's similar in appearance to the black widow, but the black widow can be deadly whereas the house spider just wants to be left alone. If you come across a wolf spider, then you'll see why it has its name. Thick hair that is either brown or gray covers the spider, making it look rather like a small, eight-legged wolf. They enjoy living around a lot of plants and are nocturnal spiders. The head is in an oblong shape as well as the body of the spider. This is a spider that resembles a daddy longlegs. Its legs are very long and thin, giving it the ability to easily climb on walls and plants. Although it has venom, it's usually not detrimental to people. The spider tends to make a nest in dark corners, such as the ones found in cellars, basements, or attics. The orb weaver is a beautiful spider that that creates a majestic web. Fields and gardens attract orb weavers more than other areas, which is why they are also commonly referred to as ‘garden spiders’. The large abdomen can be as large as an inch across. You'll usually see the orb weaver in sunny areas of your yard as this is where it likes to build a nest to capture more prey. Spiders can be beneficial to have around the exterior of your home as they can keep insects away. When you see a spider, pay attention to the details on it. There are some that look harmless but are actually quite venomous. If you want to keep spiders away from your home, then consider using an exterminator or using natural products that include peppermint oil or black pepper. Maintenance of your own property is easy enough, but taking on a huge landscape remodeling can be quite daunting. If you want to upgrade and enhance the appeal of your home, you need high-quality landscaping services, which will not only transform your outdoor space but will enhance the value of the property! We provide expert landscaping and care, so make sure to get in contact with us!